Dr. Suhas Kshirsagar is a classically trained Ayurvedic physician and a gold medalist from prestigious Pune University. A Rig Vedic Bramhin by tradition and an accomplished Clinician by training adds tremendous value to his clients and students alike. 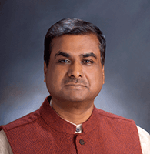 He is an insightful Medical Astrologer and Vedic Counselor. He worked with His Holiness Maharishi Mahesh Yogi for over 10 years. During these years he and his wife Dr. Manisha, traveled extensively all around the world, teaching Ayurvedic Medicine, Jyotish, designing courses & curriculums, directing Ayurvedic Clinics and helping design new Ayurvedic formulations. 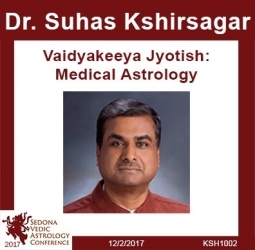 He was the Chairman for Maharishi College of Vedic Medicine, a Professor at Maharishi University of Management and the Medical Director, at the Raj Pancha-Karma center in Fairfield IA. Chronobiology-a field of biology that studies the effect of time, especially rhythms, on living systems-is finally being recognized as critical to better understanding how to achieve optimal health. In fact, the 2017 Nobel Prize for Medicine was awarded to a team of scientists who showed that a misalignment between a person�s lifestyle and their circadian rhythm could affect well-being and, over time, could contribute to the risks for various diseases. Although these findings in chronobiology-based research are still new, they reinforce what Dr. Kshirsagar has been practicing via Ayurvedic medicine for decades. The ancient Indian healing tradition maintains that all our behaviors-including diet, rest and exercise-must work together with our master internal clock to keep the body functioning well. In CHANGE YOUR SCHEDULE, CHANGE YOUR LIFE, Dr. Kshirsagar combines the latest scientific research with ancient Ayurvedic wisdom to offer an easy-to-follow road map for making small changes that can yield big results. It can be the difference between battling our bodies, and effortlessly managing weight, sleep, stress, inflammation, and more. The ancient Vedic concepts of Kala Chakra clearly outlines the impact of Celestial Rhythms, Lunar Rhythms and Change of Seasons on planet earth. We will be discussing about the effects of Time on planetary movements, Vedic Calendar & Dosha Clock.